You Are Here: Home » Personal » Petting zoo for you? Although I’m not ready to show my stuff on a full time basis, I truly enjoyed both times that we have brought our small group to a public event. The first time was at our county fair. We brought Boris the camel, Madigan & Daisy-June the miniature donkeys and a group of Pygmy & Nigerian Dwarf goats. Kids and adults were thrilled at being up close and personal with Boris and the smaller children absolutely loved being able to be in the pen with the little goats to feed, pet and play with them. I think my goats enjoyed this as much as the children! Most recently we were invited to our local elementary school for the Kindergarten & Pre-Kindergarten classes. Once there we were asked to stay a little while longer so that the rest of the students could come see, feel and experiment being close to these animals. I was surprised that although we live in a rural area, most children had never seen a donkey or a goat! 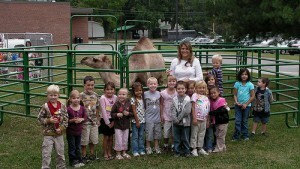 Of course none had ever seen a camel! 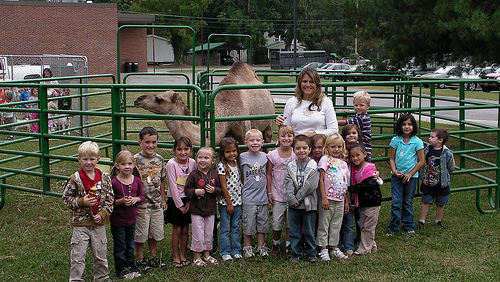 After our visit we heard some of the cutest stories… kids would tell their parents that a camel came to school and the parents didn’t believe them! This was a last minute arrangement that was organized by one of the teachers, Mrs Billyinthia Hill, the wife of my good friend Danny. He owns and operates L & J Farm Supply here in Spring City. I get all of my supplies and feed from his store but what is more important is the wealth of information I get from Danny and from others through him. As a matter of fact, Danny provided all the fencing for my animals for both of the times that I had them out. Speaking of Danny (L & J Farm Supplies), I’d like to give him credit for all of the help he’s been to me. This man is so knowledged – there is not much that he doesn’t know when it comes to farm animals. And if he doesn’t have an answer for you, he knows who does & he gets right on it! It’s not all about the stuff you can buy in a store but what you can learn from those who’ve been there before you. Thanks Danny, you’ve been a great help to me! As I said earlier, I’m not in the “Petting Zoo/Farm” business but if you’d like to come with a small group of children for them to experience mostly miniature farm animals, please contact me and we’ll see what we can arrange. For me there is no greater pleasure than to be able to share all that I have been blessed with. 2 Responses to Petting zoo for you? HEY THIS IS HEATHER IN FLORIDA. WE WERE THE OWNER OF BORIS AND I JUST WANTED TO SEE HOW HE WAS DOING?? HE LOOKS SO GOOD IN THE PIC……. GIVE HIM KISSES FOR US!!! THANKS HEATHER AND FAMILY YALL HAVE A MERRY CHRISTMAS AND A HAPPY NEW YEAR!!! He’s the best! He’s a lot of work (more than we thought) but we’re very happy to have found him. Merry Christmas!